The .408 Cheyenne Tactical is based on the .400 Taylor Magnum, which is based on a modified .505 Gibbs, necked down to 0.408 inches (10.36 mm). The .505 Gibbs is an old English big game cartridge that was designed to accommodate 39,160 psi (270 MPa) pressure. The .408 CheyTac became officially registered by the Commission Internationale Permanente pour l'Epreuve des Armes à Feu Portatives (C.I.P.) on 15 May 2013 ending its status as a wildcat cartridge. The round was designed with a possible military need for a cartridge for anti-personnel, anti-sniper and anti-materiel roles with a (supersonic) precision range of 2,200 yards (2,000 m). It is offered as a competitor to the most common military NATO long-range service cartridges such as .338 Lapua Magnum and the .50 BMG. 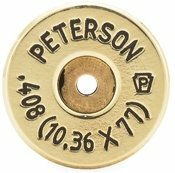 In the .408 CheyTac cartridge casing design particular attention was directed toward thickening and metallurgically strengthening the case's web and sidewall immediately forward to the web to accommodate high chamber pressures. In modern solidhead cases, the hardness of the brass is the major factor that determines a case's pressure limit before undergoing plastic deformation. Lapua Ltd. solved this problem when they used the .416 Rigby as the parental case to the .338 Lapua Magnum. They created a hardness distribution ranging from the head and web (hard) to the mouth (soft) as well as a strengthened (thicker) case web and sidewall immediately forward of the web. This method results in a very pressure resistant case.